If you are looking for a TV which offers excellent performance and a great design then look no further. 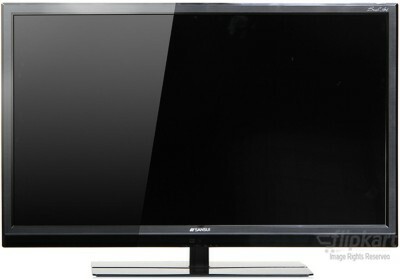 With the Sansui SJX32HB 32 inch LED TV entertainment will never be the same again. Visually Enchanting The Sansui SJX32HB comes equipped with an LED-backlit LCD display which produces vibrant images that are very crisp and defined. Certified HD Ready, this TV delivers a resolution of 1366×768 pixels, hence it creates crystal-clear images that have a fine detail. With a spectacular contrast ratio of 300000:1, this TV elucidates the darkest parts of images and meticulously renders dark colours and shades; horror films just got much more thrilling and frightening now that you can witness them down to the very last detail. The Sansui SJX32HB is able to display 16.7 million colours, which means that you can enjoy countless films with all of their brilliance as you can witness the many rich colours that exist in the RGB spectrum. Furthermore, the gracefully thin design of this TV along with its compact size make it the right buy if you are looking for a TV that’ll go well on pretty much any wall in your house, be it your living room or your bedroom. Seamless Connectivity Worried that you won’t be able to watch a new blockbuster flick that all your friends saw but you didn’t? Well, simply ask one of your friends who has the movie with them to come over to your place with the hit flick on a USB drive; once your buddy has arrived, simply connect the USB drive to your TV via the USB port and voila, the both of you can enjoy it on the Sansui SJX32HB’s marvelous TV screen. Additionally, you can also connect external HD sources such as a smartphone, gaming console, computer or Blu-ray player to this TV with the help of an HDMI cable so as to view their digital contents; almost every HD source can be integrated with this TV, so go ahead and heighten the delight your draw from technology. Also, the in-built CONNECT technology allows this TV to receive signals directly from the source, hence it gives you a fine digital experience.